If you have Add and Edit users permissions in your HubSpot account, you can create new users, customize user permissions, and remove users from your account. Enter the email address(es) into the Add email address(es) field. If you are adding multiple users at the same time, separate email addresses with a space. Then click Next. Import users from a CSV file. In Excel, add an Email column with the email addresses of your users, and save the file in a CSV format. Click A CSV file, then drag and drop your .csv file, or click choose file to browse files on your computer. Then click Next. If you have the Salesforce integration enabled, you can import users from Salesforce. Click Salesforce records. By default, all of your Salesforce users will be selected for import. Uncheck the boxes next to any users you do not want to import, then click Next. Set up the permissions for your new user(s). Keep in mind that if you've added multiple users at once, you'll be setting the permissions for all selected users. Review the full breakdown of HubSpot's permissions settings and navigate through each of the tabs to customize the access for your new user(s). If you've added a single user and would like to give them Super Admin access, click the Actions dropdown menu and select Make Super Admin. If you've added multiple users, you can do this after adding them by clicking the name of a user, then clicking the Actions dropdown menu. 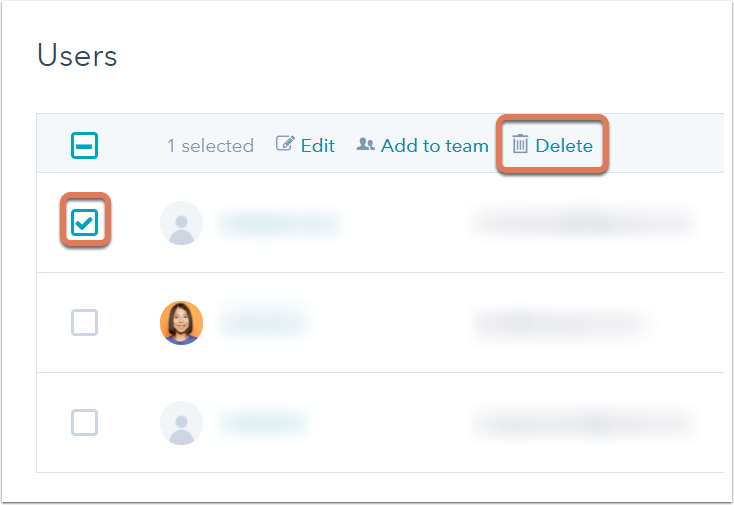 If you've added a single user, you can also add the user to a team now by clicking the No team assigned dropdown menu below the user's email address and selecting the team. If you haven't created any teams yet, or if you've added multiple users, learn how to create teams and add existing users to them. When you've finished setting up your user(s), click Next. Click Send to send your user(s) a welcome email and give them access to your account. The new user should receive an email welcoming them to your account and prompting them to set their HubSpot password. If the user is already a user in another HubSpot account, they will not need to set a new password, but will now have access to your account when they log in. If your new user doesn't receive a welcome email within five minutes of being added to your account, ask them to check their Junk/SPAM folder. If the email doesn't appear there, the user should follow the steps to ensure HubSpot emails are delivered. You can then give them access by sending a reset password email. The new user can also do this directly from the login screen. Once the new user logs in, they can set up their profile. Please note: if you want to delete a Sales Hub Starter, Professional, or Service Hub Professional user, you must remove access to the paid sales and service tools before deleting the user. When a user is deleted, all content (blog posts, pages, lists, workflows, reports, forms, etc.) they created will remain in your account. Any social messages published by the deleted user will remain published; however, please note that if the deleted user was the administrator for any social media accounts, you may need to reconnect those accounts. Verify any changed permissions within your social media settings (Marketing > Social > Settings). Any sequences, templates, and documents created in your account will remain; however, keep in mind that the deleted user must have shared their sales templates in order for other users to access them. If you remove a user from your account, Deactivated User ([deleted user's email address]) will appear in the ownership property for any contacts, companies, deals, and tickets owned by that user. 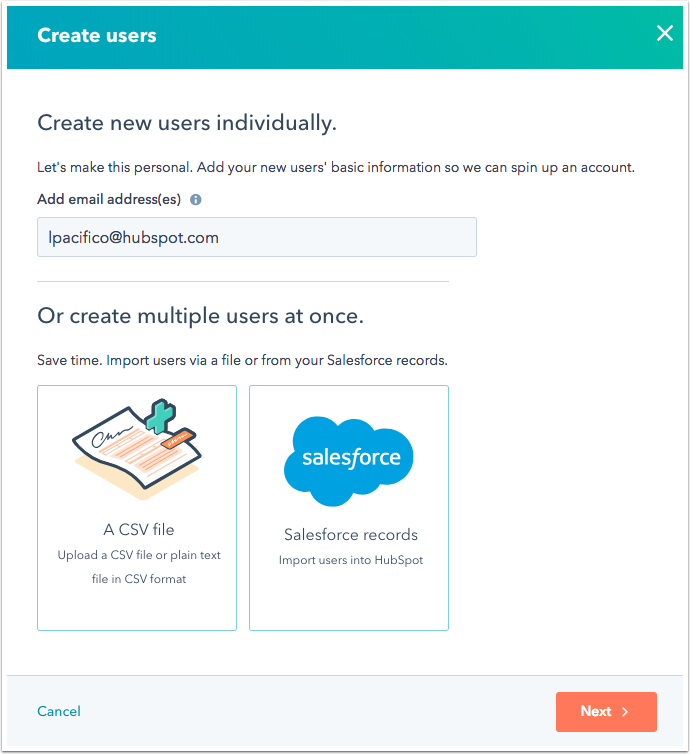 If your HubSpot account is synced with Salesforce and the removed user is still a Salesforce user, the user's name will appear as Name (Salesforce), as it does for SFDC users who never had HubSpot access. Before removing a user, you should reassign any contacts, companies, deals, and open tickets owned by the user. Set up filters for records owned by the user then bulk edit the owner property or, if you have access to workflows, enroll contacts owned by the user and use the Set a contact property value action to change the owner value of all enrolled contacts. Learn more about setting ownership of records in HubSpot. Please note: you'll continue to see Deactivated User ([deleted user's email address]) in your list of contact, company, or deal owners when segmenting lists, building workflow criteria, and in any other areas of the tool where the user owned any records as long as the deactivated user owns at least one record in the account. Select the checkbox next to the user you want to remove, then click Delete at the top of the table. You can select more than one user for bulk deletion. In the dialog box, click Yes, remove user. Once removed, the user(s) will no longer have access to log into your HubSpot account.